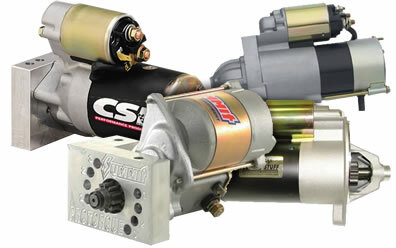 Ladies and gentlemen, start your engines with starters that deliver maximum cranking power! Our lineup includes standard full-size starters for street machines, high-torque and high-compression starters for race engines, and compact mini starters for tight clearances. Fire up your engine with industry-leading brands—MSD Ignition, Powermaster, Tilton Engineering, Meziere, ACCEL, and more—and look good doing it with a variety of finishes. We’ve got top-quality starters in chrome, polished, powdercoated, iridited, and natural finishes. Choose from Hitachi, Denso, Ford 2- and 3-bolt, Brinn/Bert styles, and more—all at guaranteed low prices. This search has too many results (5,127) to show them all. Continue to "Narrow Your Results".